Bummer that that B%#@$ outbid you on the roller skates. You'll find some other ones that are even better! Your outfit for the party sounds amazing! 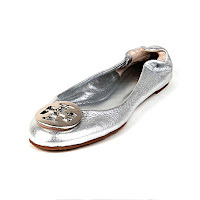 I love your new Tory Burch flats! Have a great weekend! Can't believe that skank-ho outbid you on the roller skates! The nerve! Keep looking though, because your costume sounds coolio! Good luck at IKEA. I got there today at 2:30. Yes, that's right, 2:30 on a Saturday afternoon. What I will do for my parents! UGH! I have the same TB flats. They are fabulous and I adore them!!!! I love my rollerskates too! You need them! Just have to say...I have to borrow this idea. A Disco Roller Skating Party sounds like a blast! Love the shoes and hoping those pesky money issues clear up soon!